Snake River dams must stand forever (Part 2). 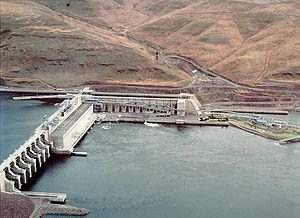 Representative Peter DeFazio did not sign onto a letter signed by nearly 100 members of Congress that urges NOAA consider breaching the lower Snake River dams as part of the federal Columbia Salmon BiOp. DeFazio also does not support the Salmon Economic Analysis and Planning Act (SEAPA). Meanwhile, the Snake River salmon continue to slide toward extinction. "We should certainly be moving toward more alternative energy sources like wind and solar, but the alternative generating capacity required to replace those dams would not come on line for at least a decade . . . ." Peter DeFazio, in an email dated June 15, 2007. I responded that it is difficult to conceive that the power generated by these dams would be allowed to go off-line prior to completion of new projects ensuring the regional power supply. Realistically, would anyone let the region's power supply be threatened? No. Let's hope reason #3 passes the smell test. DeFazio and Bush bedfellows: Snake River dams must stand forever (Part 2).